On December 11, 2016, City Councilmember Julie Palakovich Carr and two other members of the immigration working group for Progressive Women Working Together (PWWT), a Rockville-based women’s group formed after the election to resist the Trump agenda, held their first meeting. At that meeting, Palakovich Carr expressed concern that the RPD’s unwritten policy of limiting cooperation with federal immigrant enforcement actions was no longer robust enough to withstand increased pressure from Washington on our police to take enforcement actions at odds with our city’s values. She agreed to talk to RPD officers and the city’s attorney and research options to shore up the policy, which has served the community well for decades. With one out of three residents born abroad, Palakovich Carr believed Rockville would support the effort to protect immigrants and preserve community policing. By the next immigration working group meeting on January 29, Palakovich Carr presented a draft ordinance she had developed after discussions with police and lawyers and research into similar legislation from other jurisdictions. To gauge support from the community, working group members launched a Change.org petitionand a Facebook page. 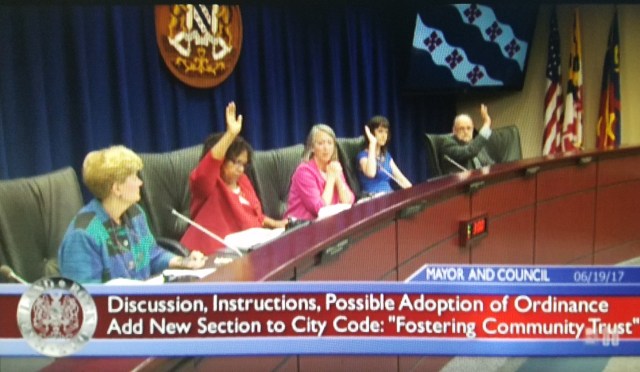 Their belief in Rockville’s values of diversity and inclusion was well-founded; an overwhelming majority of city residents expressed support, with most opponents residing outside city limits. This article is reprinted from the Montgomery County Civil Rights Coalition website.